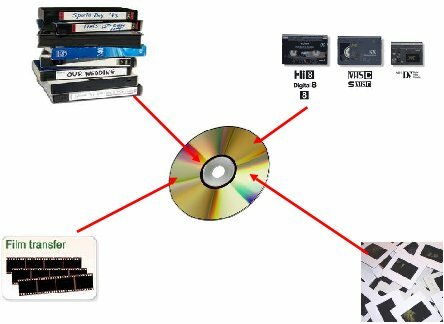 Here you can have your video memories transferred onto a PAL system DVD. Based in Bracknell, we operate a pick-up and drop off service within 4 miles of Harmans Water, or a postal service using the Royal Mail. Having operated on a small private scale since 2009, the commercial venture was opened up in October 2011 with over 100 happy customers having their treasure transferred to DVD since. The process is simple. We take your video memories and transfer them straight onto DVD. There are no fancy add-ons like music, titles or editing. Of course, if you recorded your home video over the top of a TV programme, we can edit out the programme from the end of your recording. Current average time between receiving the tapes and notification of completion is 7 working days. Please contact us for more accurate timings if you are considering using our service. Below are some examples of the type of transfer we offer. Weddings: It’s that special day in anyone’s life. Several clients have given me their wedding tape an unfortunately somebody has taped something over the top part way through. We cannot undo what has been done so why not let us transfer you wedding video before any such disasters happen to your tape. Do you have a special anniversary coming up? You could include this in part of the celebrations and have it play in the background or give it to the happy couple as an anniversary present. Family Holidays: Transfer all those memories of the places you have visited. It could be your first holiday as a couple; places you have never been before; or how about that trip of a lifetime you spent ages saving up for. Children growing up: This is the most popular category of video tape from age zero all the way up to graduation. Those nativity plays, dance recitals, concerts, shows, horse riding. Not only memories to treasure, but you could always embarrass your children by playing a compilation of them at their 18th/21st Birthday/ wedding etc! Any other special events you care to have recorded for memories. Please can you help I have a mini dv tape that needs to be put onto DVD ASAP to send off for a course. Please can you advise if I can get this done ASAP I am in te bracknell area.